Glassblowing, the practice of shaping a mass of glass that has been softened by heat by blowing air into it through a tube. Glassblowing was invented by Syrian craftsmen in the area of Sidon, Aleppo, Hama, and Palmyra in the 1st century BC, where blown vessels for everyday and luxury use were produced commercially and exported to all parts of the Roman Empire. At first, glass was blown into decorative molds; vessels shaped as shells, clusters of grapes, and human heads were common early Syrian products, but later Syrian gaffers (blowers) executed natural, spherical forms, without the use of molds. The technique has remained basically the same to the present day. 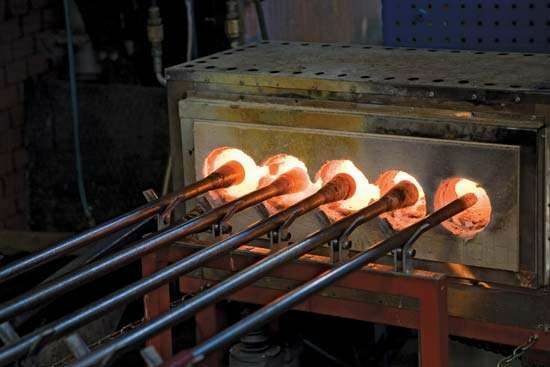 The “metal” (molten glass having the consistency of molasses) is gathered on the end of a hollow pipe, inflated to a bubble, and formed into a vessel by blowing, swinging, or rolling on a smooth stone or iron surface (marver). Additions, such as stems, feet, or handles, are attached by welding. While still soft, the glass can be manipulated by hand tools or cut with shears. In the 17th century the gaffer’s “chair,” a bench with two extended arms on which the pipe is trundled to preserve the symmetry of the molten glass, came into use. The chair has been extended to include the glass making crew, the gaffer and two or three assistants.